For the FIRST time in my life, I baked a banana cake & a successfully, nicely-browned cake! This little oven in my rented house hasn't been extremely cooperative, so it's a rare opportunity to get nicely browned cakes. I'm SO PROUD & happy to see this cake looking AND TASTING SO DELICIOUS! 2. Sift flour, sugar and bicarb soda into a bowl and mix together. 3. Make a well in the center and add bananas, eggs, vanilla essence and oil. 4. Using a large spoon, stir gently until mixture is smooth. IF the batter seems slightly dry, add the 2 tsp of milk, little by little, mixing the batter to test the consistency/liquidity. It shouldn't be too thick & lumpy nor should it be 'watery'. 5. Pour into cake tin and bake for 30-40 minutes or until a skewer comes out clean. 6. Turn onto a wire rack and allow to cool before icing (or leave it plain). Bali, alike any Asian countries, is a land abundant in food options. More often than not, if you're keen to try their local dishes, it's very similar to the Malay food that we get back in Malaysia i.e. rice, rice, & rice! Of course, being a very tourist-driven land, Bali has tonnes of westernized food to offer, some of which are really recommended. During our trip to Bali, the one place that we actually went TWICE is this unplanned restaurant near our 1st hotel (Sun Royal Hotel, Jln Sunset), Nasi Tempong Indra. If you're familiar with ayam penyet with rice back in Malaysia (it's an Indonesian dish by the way), this is very similar. This is a MUST try if you're staying around Seminyak, Legian or Kuta area & it's PerutBesi's top recommended place to eat for a local meal in Bali! So what exactly is nasi tempong? The main characteristic that gives it its name "tempong" is the extremely spicy grounded chili paste that makes you feel 'slapped' & 'hot' on your face (meaning of 'tempong', an Osing language from Banyuwangi, East Jawa = slapped). Every nasi tempong is served with an assortment of blanched vegetables like spinach, aubergine & sweet gourd plus deep-fried tempe (fermented beans - VERY tasty!! ), salted fish & a piece of fried tofu. The high volume of orders! If you're here after 7pm, this place can be quite packed, even on a weekday. Our 1st trip there was on our FIRST night at Bali. Upon arrival around 9:00pm, we were just famished & wanted something decent to satisfy our hunger. Our driver, Komang, drove us around the hotel area & we ended up having nasi tempong at this restaurant (best decision!). We had this for our 1st meal & we ordered the same during our 2nd time here as it was SO good! The grilled 'catfish' was very flavorful, slightly sweet, slightly spicy & savory. The charred taste was also evident & extremely aromatic. Yums! Catfish like this species have very 'sweet' meat, not many bones & very easy to eat/dissect. I loved the crispy tempe & the fried tofu as well (crispy on the outside, soft on the inside...not oily too!). The blanched vegetables are very 'al naturale' - fresh, texture that's just-right & well, without any salt/sugar taste added to it! Loved the fluffy rice as well & oh, the crazily explosive chili paste was something that we couldn't take. It was SPICY!!! But it was also SO GOOD! Gives a kick to the simple dish. We added some kicap manis to balance out the taste as well. It was just yummy! If you're not a fan of meat & just prefer something simple, healthy yet tasty, go for the tempe penyet. You'll have 1-2 LARGE pieces of flattened tempe, deep-fried 'til crispy to accompany your assortment of blanched vegetables. What a symphony of textures! :D I LOVED IT. If you prefer chicken, we tried that too during our 1st night, but I forgot to bring my camera out of the hotel room, so I ended up using the handphone for photo-taking. Color isn't great, but taste of the dish wasn't compromised. You'll get a 1/4 chicken, deep-fried 'til it's slightly dry & crispy to accompany the blanched vegetables & rice. We prefer crispy & juicy fried chicken, but I know my cousin will surely love this! 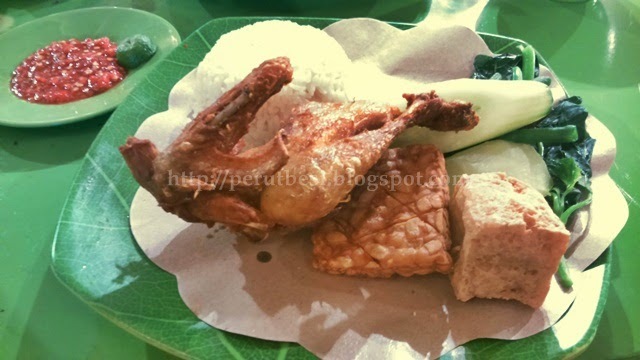 Don't miss out trying the Nasi Tempong while you're at Bali! The other local delicacy that's a must-try when you're in Bali is Babi Guling. Out of 10 persons who have been to Bali, at least 9/10 would say "Babi guling is a MUST try!". Unfortunately, this is a non-halal rice dish, so to all my Muslim readers, just go & enjoy the nasi tempong 'til your heart's satisfied :) It's worth every mouthful. Our itinerary was quite packed for the 5d4n trip, so babi guling wasn't exactly part of the plan. We wanted to have it, but our appetites weren't great (considerably small eaters although ruthless ones). We ended up packing nasi babi guling from a warung on our way to the airport before we left Bali so that we can enjoy a local delicacy at the airport while waiting for our flight! This was one decision that we never regretted! We've our driver for that day, Putu, to thank, for stopping us at this warung (he thinks this place has good babi guling at non-tourist prices) to get our dose of babi guling. Babi guling is actually just roast/suckling pig. It makes me wonder why people are so crazy about this when we've much roast pig & roast pork available in Malaysia. If you want a "special" pack with more meat, it's Rp10,000 more. Since we just wanted to try & weren't very hungry, we decided to have the usual portion of meat instead of 'more meat' before we board the flight :S Oh, there were tonnes of 'hidden explosive mines' in the rice as well. Balinese just LOVE hiding chili padi in every rice dish!! The more tourist-famous place for babi guling rice is at Ubud i.e. Babi Guling Ibu Oka. According to our driver, Putu, taste of the babi guling there isn't a far cry from the usual babi guling rice that you find everywhere else. 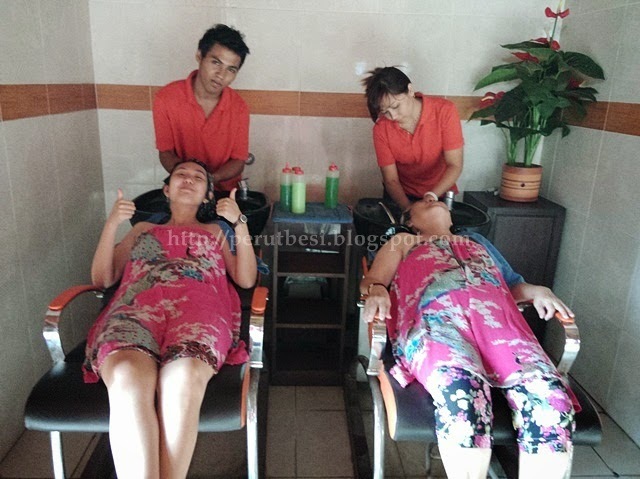 In fact, you'll end up paying at least Rp10,000 - Rp30,000 more at the popular places like Ibu Oka's. So, I guess we didn't miss THAT much, or did we? I'll have to make a trip to Babi Guling Ibu Oka some other time. But for now, I can at least say that I've tried nasi babi guling once in my lifetime! Stay tuned with The Ruthless Eater! Local, non-tourist eateries are the way to go!